Products manufactured by Empire are some of the most reliable in the market. When you think of high-level satisfaction in outdoor games, you will not go wrong with Empire products. The Empire Axe Paintball Marker is easy to use and highly effective when it comes to achieving your goal. This gun can be used from a long distance and still attain the desired accuracy in comparison to other paintball markers in the market. Empire Axe gives you as a player the tactical advantage you desire over your opponents. It is also easy to clean hence preferred by most users. In our Empire Axe paintball marker review, we will be looking at Empire Axe specs and usability in detail. Empire Axe paintball marker has some of the rarest specs in the market, which makes it the number one choice for most people. The performance of the marker is enhanced by the accuracy and lightweight characteristics of the marker. It also has the Relay ASA that utilizes the lever to help create an airflow hence allowing the release of the bottle. The Empire Axe Paintball cleaning and maintenance is made easier by the presence of a push-button bolt removal feature. The barrels of this gun are made of Aluminum, which makes them lightweight for easy, quick, and accurate shots. The gun is suitable for a wide range of users because it is manufactured with multiple adjustable firing modes. The paintball gun is made comfortable during use through the installation of an extended grip frame. This comfort is enhanced by the new grip developed to make the brand unique in the market. The firing modes include the Millennium Ramping, NXL, PSP Ramping, and Semi. This covers the desires of each user based on his or her physical prowess and expertise. These firing modes installed in the paintball gun make it suitable for beginners and pros altogether. The Empire Axe is a bit pricey compared to other paintball gun models but the investment is worth it. This paintball gun brings excitement in the player, as it is easy to hold due to its lightweight. Its frame is created with a large space that allows the player to hold the gun with the greatest comfort. This means that the players will be able to run around with the paintball marker for a long time with minimal effort. The paintball gun is preferred by most professional players because of the accuracy of the shots made. The aluminum barrels are light enough to facilitate easy shots, simplicity, and a high level of speed to ensure maximum accuracy during use. This is one of the paintball markers that can shoot with limited recoil as long as the bolt is lubed congruously. The recoil is also minimal if the o-rings surrounding the bolt remain in place. The accuracy of this paintball gun is enhanced further by the good range designing it comes with. The Empire Axe paintball marker is powerful and a preferred tool for tournaments by some of the top professional players across the world. The strength of the paintball gun during use in the field has enhanced its demand as some of the users describe it as a little beast. The speed produced while firing the gun in the field due to its lightweight and accuracy has also helped to improve the power during usage. The elasticity after firing produces little recoil that enhances the efficiency of handling the gun. The great recoil also increases the power of the gun when shooting hence meeting the preferences of its users. The high level of power is maintained due to the durability of the gun. The gun’s durability is enhanced by the easy maintenance process after use in the field. Actually, power is the number one feature that makes the gun unique in the market. The maintenance of guns is highly essential for users because it helps improve the durability, reliability, and efficiency of the gun. The ASA Relay installed in the Empire Axe paintball marker makes the removal of the tank as easy as desired. It is described as the relay regulator and it is characterized by the presence of an on and off lever. Another unique feature describing the Empire Axe Paintball gun is the presence of the push button removal system. This unique characteristic has increased the demand of the gun in the market since it makes the maintenance process easy, quick, and efficient. The paintball marker is best cleaned using warm water, a toothbrush, the gun’s schematics, Allen keys, squeegees, and a lubricant. It is essential that you consult the manufacturer’s guidebook for cleaning and maintenance tips and instructions. The aim is to conduct proper cleaning on the inside before re-oiling the gun. The Empire Axe paintball marker is designed with a stock 12-inch barrel, which is a downgrade compared to the features of a perfect gun. It is essential that the stock barrel be designed with a lenght of at least 14 inches. The longer barrel enhances the efficiency, accuracy, and reliability of this gun. The other upgrade that can perfectly work for the gun’s performance is the use of a Critical Axiom trigger. This improves how one feels while holding the gun in the field hence allowing the user to make an accurate shot. It is essential that you note that not all brands of paintball guns in the market are designed to accept any form of upgrades. The Empire Axe paintball marker, however, accepts upgrades because the company’s main objective is to enhance the ergonomics of its brands. If you wish to acquire a paintball marker for fun, tournaments or business, the Empire Axe paintball marker could be a good place to start. Unlike the paintball gun brands from companies like FX, Geo, or Reflex, Empire Axe has a reputation for its superior features. The unique specs enhance the quality of a gun and make it suitable for a wide range of players. Empire Axe is easy to maintain, accurate, powerful, reliable, smooth, and comfortable to use. The greatness of this brand has become evident as most victorious speedball tournament players consider it a favorite. 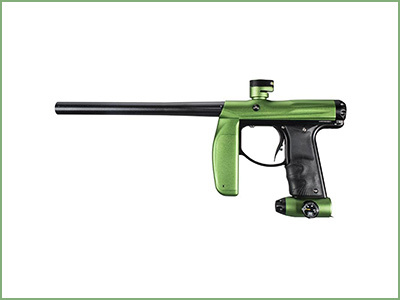 We consider one of the best paintball guns on the market. What did you think of our Empire Axe paintball marker review? Is there anything you would like to add? Tell us in the comments!